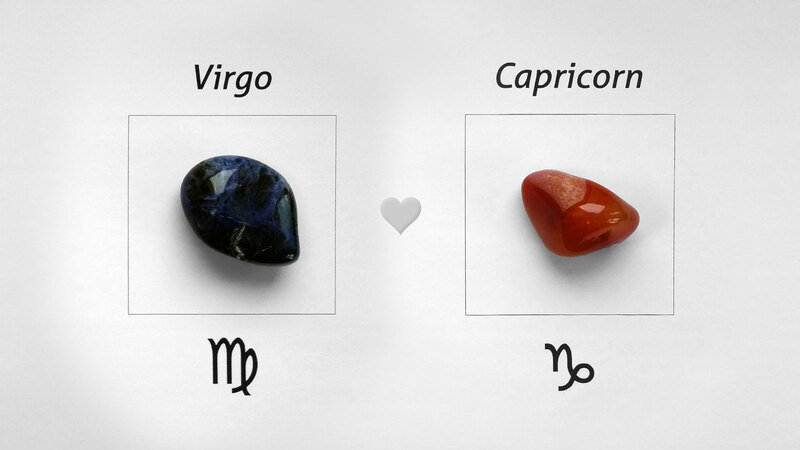 Virgo and Capricorn are very compatible in love. Both share the common element – the earth. The love can be extremely strong on this base. The man and the woman, are pragmatic and focused on true material values. It can be a real surprise when Capricorn and Virgo notice that there is something like the mutual affection. It may be at a breakfast in a hotel or when travelling by train, they can look to each other’s hands and realize that they are reading a book by the same author. It is usually not the “animal” love at first sight, but rather the slowly growing relationship. As Virgo and Capricorn discover how much they all have in common, their love is steadily spreading all over the heart. The tolerance is a necessary ingredient of the durable bond between man and woman born under these zodiac signs. If one thinks that the turkey is suited for Christmas dinner and the other thinks that the turkey is better to eat on Thanksgiving (not mentioning the Christmas crackers), it does not cause any problems. They can happily buy a larger bird and eat the half each day. Capricorn and Virgo together remind the induction coil. The man is the iron core and the woman the copper wire wound around it. Together in bed they are able to produce pulses of high sexual voltage! Because of their common earth essence both like flowers and their smell have the aphrodisiac effect especially on women. Virgo as well as Capricorn are curious but cautious explorers in regions of sexuality. But the gained sexual experience supports the ideal compatibility, which is already guaranteed by their love horoscope. The Virgo man is like the clip that is able to connect different sheets of paper (various sexual desires) of the Capricorn woman. The Virgo woman, on the other hand, will not shrink away from unusual intimate proposals of the Capricorn man. Of course, you have to leave enough freedom to her and the ability to say no when she discovers that she does not like your secret sexual fantasies. All in all, the sexual compatibility between men and women born under Virgo and Capricorn is simply great. The marriage is the logical result of a long-lasting love of Virgo and Taurus. Despite their inclination towards the wealth, Capricorn and Virgo are able to perceive the marriage as a deep spiritual bound in the first place. The marriage does not mainly represent the union of their property and the exchange of the first-class genetic information, that all is secondary for such platonic men and women. The traditional and publicly recognized form of relationship, as the marriage undoubtedly is, is often attractive for Virgo and Capricorn. Both these zodiac signs are more or less conservative. They do not want to rescue each other, but they know that to travel in two (or more when considering the children) is simply more enjoyable. The compatibility of Capricorn and Virgo in marriage reminds a pleasant dream. It is nice to have a dream during the night but it is even nicer when it becomes the reality! Do not imagine the dating of Capricorn and Virgo as a sociological research, in which you evaluate the other person with exact test questions. Yes, man and woman born under those zodiac signs are clever and very rational, but they are able to exclude the brain from the rating procedure at the right moment. The intuition is crucial in dating and matters of love. The Virgo man can successfully sow a seed of love with romantic and poetic words. He does not lack the imagination while dating. The Virgo woman acts as an investigate journalist. She asks tough questions, but soon she has also a clear idea whether the man is worth of her love. The Capricorn men and women are never confused with the dating tactic of Virgo. They know that it is not allowed to say many important things directly and Virgo is, of course, a born diplomat. Even when the compatibility of man and woman born under Virgo and Capricorn seems to be perfect, sometimes there is an itch which can not be scratched. Or, better to say, there is the lack of will or the fatigue from the ageing relationship or from the faded marriage. And here comes usually the breakup. It is better not to cover the intentions behind a veil. To be honest can make things easy to your beloved, either to speed up the breakup or to stop for a minute and refuse such step as silly. The friendship of Capricorn and Virgo is the genuine one. They can be good friends on studies, equal to each other, but occasionally one is in the role of the coach and the other acts as the disciple. Nevertheless, both have the respect for the other. It does not matter if they share a tent, an army tank or a picnic blanket. Virgo and Capricorn are able to agree in most situations. Both can realistically estimate their strength, what is essential for the balanced friendship. They will not fly to the sky, if the tank of the aircraft is not completely full. They will not try to beat the tiger, if there is a comfortable and short detour. They will not sail upstream, if no pirate ship is behind.